If you have been earning money online and especially worked on link shortening sites then you have heard about Adfly, which has been paying since 2009. 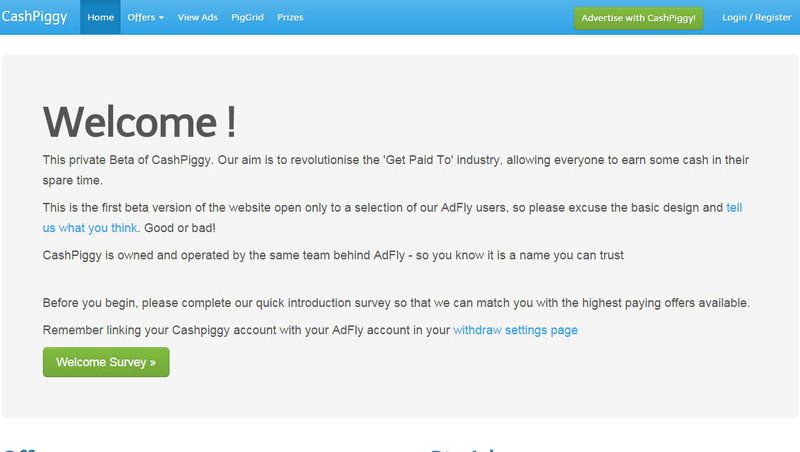 Cashpiggy is a new program owned by the same admin of Adfly. Now they have started a GPT site (Cashpiggy) and in this site you can earn money by just completing simple tasks like viewing PTC ads, completing offers and surveys. If you look at some more prominent sites that are in GPT industry like Clixsense, InboxDollars, Swagbucks, and Cashcrate to name a few, they have been paying online for years. We have to look at whether this site will use old ways that are offered by other sites or provide some more opportunities as they have mentioned in the FAQ section that their aim is to revolutionize the ‘Get Paid To’ industry. How to Earn Money from Cashpiggy? View Ads – This is very similar to other PTC sites. After registration, this is the simplest way to earn some cents. Just click on the ad and wait to complete. As soon as it gets completed, type the CAPTCHA and earnings will be credited to your account. Each ad will last for 5 to 60 seconds and rewards you $0.001 to $0.02 cents. Complete Offers – On the top of the site page you can see offer tab with a drop down menu. There are two types of offers one from Cashpiggy, which are offers imported from best CPA networks and listed after manually approved by the admin. Other offers are simply widgets coming directly from offer networks like offerwalls Persona.ly, Wannads, SuperRewards, Matomy and Wallads. Select one offer at a time and complete as per instruction are written there. That will show pending until approved by network site and then money will be credited to your account. 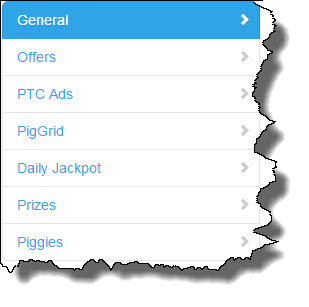 PigGrid – It is simply a new way of advertising, and a member has daily a limited number of attempts to click on the grid. After the click, wait for the ad that will last for few seconds and if lucky get earned you few cents to $10. This is a chance, and mostly you would not earn anything at all. Daily Jackpot – Every day, PigGrid will run a daily Jackpot, where PigGrid members will automatically pass in to win the prize money. The more clicks the member does, the more probability to win the JackPot. Referrals – To increase your earnings, refer as many people as possible because by performing above tasks would only help you to earn few bucks per month. If you are looking for $50 or $100 from one PTC site, then the only way is to refer people. The best thing is this site offers an unlimited direct referral program. You will earn 20% of your referrals earnings and 5% commission on every advertising that your referrals buy. The group as a whole is very trusted because Adfly has been around for years. If you look at the industry, primarily PTC sites then it is full of scams. Same people are coming with the different names and then run out with the people money. In such an industry, paying its members for more than six years is a clear signal about the honesty of admin. If you look at the site then it offers different earnings ways one can use and each earning method is very simple and even a complete beginner can do any of the tasks. The best way is to click daily ads and complete offers, if available. Clicking daily ads will only reward you better once you have large downline otherwise it is of no use. Despite multiple earnings opportunities, if you are clicking on your own and completing offers you will only reach a few dollars after each month. So no one wants such results after putting so much effort. If you look at the offers, it is mostly available to people of USA and Canada. If you belong to another part of the world then simply there is very few offers or nothing at all. Some of the offers demand your personal information like phone number, email address, and credit card information. Large trusted sites also require this and the purpose of this is to check whether the customer is a serious one who is actually looking for product information. While at the same time, most of the scam companies have started demanding your personal information with the intention to scam people. I cannot recommend anyone be part of such networks. There may be difficult to separate scams from the legit, so the only solution we have is to avoid any company that demands such personal information. Most of the people who are part of such sites are those who have just started their online career, and they struggle to get referrals and if you don’t have referrals then don’t waste your time on such sites. There are various ways you can use like advertising on other PTC sites, social media, and creating your own blog. I will definitely go for the last one. Either way, you choose, they have one thing in common, they will cost you money. Currently, the site is in beta phase and all the withdrawals requests are handle from Adfly. Admin is working on incorporating different processors within the system, but it looks like it will take time. If you have earned points, then you can redeem it for cash, Amazon gift cards, and Walmart gift cards. Minimum payout is $5. They are also incorporating a new reward system in which you will be rewarded piggies for any activity you perform on the site. In short, it looks like a promising site from a trusted admin. I will only recommend this site if you can get hundreds of referrals, and then you will reach something like $50 to $200 per month. If you are just doing on your own, you will reach withdrawal limit after months. I have been part of such sites in the past but never made enough money and most of the times when I reached cashout limit then the site will become a scam. Moreover, it is not for professional people who are looking for full-time income online, and if you are one of them then see my #1 recommendation.